Okinawa is a beautiful, subtropical island some two and a half hours flight from Tokyo. Although today it is a prefecture of Japan it was actually an independent kingdom until 1879 when the King was summarily replaced by a Prefectural Governor sent by the Meiji government. And although it had been vassal state of China, in 1609 the Satsuma clan of Kyushu had already invaded and enforced a dual vassal status from then on. However, to avoid antagonising China at the time it wasn't formally annexed for the next 270 years. Although a proud nation, maintaining six separate languages largely incomprehensible to mainlanders, Okinawa remains sadly troubled by its past. 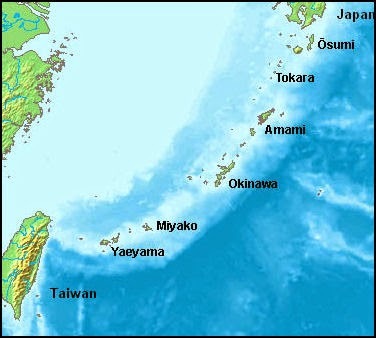 The only area of Japan to experience a land based conflict in WWII, the island lost up to one third of its population to the invasion either directly or indirectly by their own hand at the instruction of the Japanese military powers. Even today, whilst Prime Minister Abe is on tour in America, the question of the relocation, or as the islanders would prefer, the removal, of the air-base at Futenma remains highly controversial (though Abe has said "it will not be a problem" to his hosts). Post war, Okinawa remained under US administration until November 1971 when it was returned to Japanese control and finally Okinawans could again reach the mainland without a passport. Even this though wasn't without its detractors as a vocal minority were actually set on all out independence. It did mean though that the prefecture would, in 1978, become only the second world territory to convert from driving on the right, as in America, to the left, as in the rest of Japan. Perhaps the most poignant moment in its modern history though came slightly before the signing of the transfer treaty itself. Although officially unconfirmed and after everything they had been through, Hirohito casually remarked to Nixon "you can keep them if you like".